Looking for a new home? Eighty-eight percent of homebuyers use a real estate agent or broker, who becomes their guide, advisor, even confessor. But with more than 2 million active real estate agents and brokers working in the U.S., it’s hard to know which one will be right for you. We can help. Here are some steps to take and questions to ask when looking for a real estate agent to help you buy or sell a house. The National Association of Realtors says 86 percent of buyers are likely to use the same agent again or recommend their agent to others. So work those cocktail parties, PTA meetings and family reunions to gather names of agents who have earned the trust and respect of the people you admire most. If you're eyeing a home in a specific neighborhood, such as Decatur, go online to solicit recommendations for good agents who frequently buy and sell homes in your area. Real estate agents must be licensed by the state to buy and sell homes, which requires passing an examination that tests knowledge of laws and best practices. Licenses must be renewed every few years, and each state sets its own renewal schedule and requirements, like taking continuing education courses. To discover if the real estate agent you’re considering is licensed, or has been disciplined by a state review board, contact your state’s department of professional and occupational regulations. In Georgia, for example, ask your real estate agent for their name and license number. Then use this website to make sure they're in good standing. When the results appear, click on the license number to see whether or not the agent has any disciplinary sanctions on record. Of course, everyone has to start somewhere, and a brand new real estate agent can ably handle transactions. But nothing beats experience when it comes to navigating the myriad problems and challenges that arise when buying or selling a home. Choose an agent who knows how to handle inevitable closing glitches and can give advice on how to prepare your home for sale. An experienced agent also has a wealth of contacts that they will mine to help you buy or sell a home. Several members of the Keen Team, for example, have been in the business for 15 years. Ask prospective agents to reveal their recent sales in your neighborhood. How many homes have they sold in the last year? How many homes have they sold at, above or below list price? How many houses did the agent sell in your neighborhood? 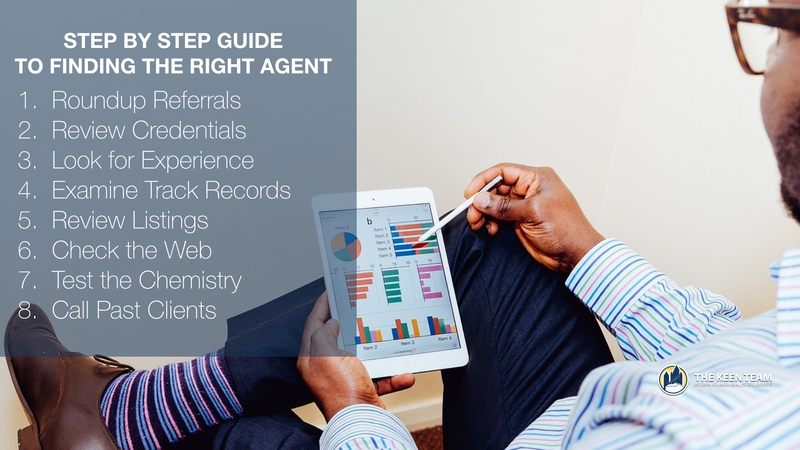 The Internet makes it easy to discover the number and quality of listings your prospective agent already represents. You want an agent who is in demand, but not so busy that they can’t give your home the attention it deserves. Ask yourself if current listings mirror your property, which indicates that the agent has experience marketing homes like yours. How many days has each listing been on the market? The national median is 66, so if the agent regularly sells homes in, say, 50 days, they’re doing a good job; if they sell a house in, say, 10 days, they may be pricing homes too low (or the neighborhood might be particularly hot). Make sure your agent is web savvy, because 85 percent of all buyers first see their eventual homes online. Check out the agent’s website to make sure it attractively and thoroughly presents each listing. Select an agent who is active on social media, which increasingly is becoming an essential marketing tool. Does the agent have a Facebook page? Does the agent write a regular blog and consistently tweet about listings? You want an agent who effectively uses all tools at their disposal. Chances are you’ll spend loads of time with your agent, driving through neighborhoods and traipsing through houses; so make sure you get along. During courtship, does the agent answer questions thoroughly? Does he/she return your calls within a day? If you’re not feeling special before you sign the exclusive representation agreement, chances are you won’t during the time it takes to find or sell a property. Ask the agent for names and numbers of satisfied customers. Call those past clients. Ask questions such as: How many days their home was on the market? Did the house sell for above or below asking? How prepared was the agent at closing? Did the agent have a list of contractors who helped prepare the home for sale? If you sense the client is hedging or qualifying answers, dive deeper. On the other hand, if you sense that the past client is genuinely enthusiastic, you might confirm that this is a great agent.